There's nothing like a painting with a new brush. My absolute favorite type of brush is a flat, but no matter how hard I try to take good care of them they wear out pretty quickly...or maybe it's just that I usually find a favorite and then use it every day. But once a flat brush does that weird fanning out thing, it's pretty much a lost cause. My favorite paintings surface, hands down, is Ampersand Gessobord. They're a little on the pricey side...but so worth it, since they're magic. 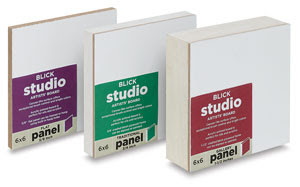 A few months ago however I bought a lot of these Blick panels, they're not terrible, but they have this weird canvas texture on them that bothers me sometimes...they're just not quite as magical.